Virat Kohli is the Man of the Match for his knock of 92. OUT! That's it! India win by 50 runs and go 2-0 up in the series! Bhuvneshwar traps the vulnerable Richardson leg-before off the first delivery of his new spell, and the umpire raises his finger straightaway. The Aussies go for the review, and fail to get it overturned thanks to three reds, getting bowled out for 202. OUT! Collapse! Eden Gardens is shunned! MSD has to depart. Dhoni tries to drive a ball which is far off his body and he can't keep it down, hits it straight to Steve Smith at cover. OUT! OH MY WORD! Just when nothing seemed to get past Kohli, he has chopped it back on! 8 short off what would have a fablous century. 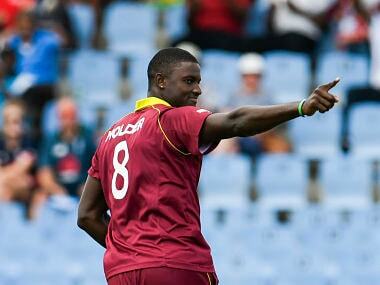 Coulter-Nile with the wicket again! OUT! Jadhav is gone! Coulter-Nile strikes. Kedar has hit it straight to Maxwell at point. He is livid with himself had got the start but has thrown it away. FIFTY-PARTNERSHIP up between Rahane and Kohli for the second wicket! The two have had a healthy mix of boundaries in their partnership. Rahane brings up the milestone with a single in the 14th over. Two changes in the Australian side announced by captain Smith, who is playing his 100th ODI today. Agar and Richardson brought in place of Zampa and Faulkner. No changes in the home team, as Kohli had earlier indicated. TOSS: India win the toss for the second consecutive time, and captain Virat Kohli opts to bat, as he did in Chennai. That brings us to the end of our coverage of the second ODI between India and Australia, with the hosts pulling off yet another decisive victory, going 2-0 up in the ongoing series. Australia did gain the upper hand on a few occasions, but in the end, India turned out to be the superior side, producing moments of brilliance in all three departments. The scene now shifts to Indore, where the two sides meet this Sunday, with the hosts one game away from clinching the series. For now, it is time for us to bid you all good night! Virat Kohli (Indian captain and Man of the Match): I dont think we didnt feel we didnt have enough on the board. We knew if we had a good start we had a chance. Bhuvi's spell setup the game for us, along with those two spinners. To be honest, the wicket wasnt that easy to bat on throughout the day. Bhuvi's spell became even more impoirtant because we knew the wrist spinners would do damage in the middle overs. He really set the tone, and his spell was outstanding. Thats what he brings to the table. Two young guys bowling with a lot of heart speaks volumes of their character. Keeps the competition going among the 20-25 (probables) with the World Cup coming up. We have a lot of options, and we have all bases covered. I always try to create that kind of miotivation for myself. I try to same in the same zone more or less when I come out to play. Australia captain, Steve Smith: Yeah, we were happy with 250 in the mid innings break. I thought we really did a good job with the ball but made bad decisions while batting. I thought Stoinis was pretty good in the end there, just needed some support. We are making poor decisions under presssure. I thought we bowled pretty well to restrict India under 250 (252). We should've chased down 250 comfortably. Kuldeep Yadav: (Did you think you would take a hat-trick?) Not really. Initially, I was to struggling to bowl in a particular area, but then as they the rest is history (reflecting on the hat-trick). It's a game of cricket, anything can happen. Last match was a learning curve where I was hit for three sixes. First one was Mathew Wade, second was Agar and I bowled a wrong 'un on the hat-trick ball. I asked Mahi bhai (about the hat-trick ball) told me, "tujhe jaise dalna hai waise daal (bowl whichever delivery you want)." This was special for me. Australia have not won a single match away from home in their last 12 ODIs. Their last overseas win came against Ireland at Benoni in 2016. This is India's eighth consecutive victory in ODIs which is their joint second best streak in ODIs. India won nine consecutive matches from 14 November, 2008 to 05 February, 2009 under the captaincy of MS Dhoni. Stoinis flicks towards the backward square-leg boundary in the third ball of the over, bringing up the 200 for the visitors. Looks like he hasn't accepted defeat yet, and is determined to fight till his last breath. Australia need another 51 off 42, which wouldn't hve been a tall ask had it not been for the lone wicket remaining. Pandya bowls his final over of the day. Stoinis smashes the third ball of the over straight over the bowler's head, bringing up his half-century in style. Seven off the over. Chahal introduced into the attack for the last time in this match. Richardson edges to the slips yet again, with the ball once again falling short of Kohli. Stoinis dances down the track, and whacks the ball down the ground in a flat hit, moving to 49 in the process. Seven off the over. Chahal finishes off with figures of 2/34. Pandya bowls the final over of the second powerplay, and gets rid of Coulter-Nile — who offers him the simplest of return catches. Chahal drops a tough chance at extra-cover off Richardson in the penultimate delivery. Richardson then edges the last delivery towards the slips, where the ball lands short of Kohli. One run and a wicket off the over. Chahal bowls his ninth over. Appeal for run-out after Stoinis is sent back to the striker's end in the third delivery of the over, with the benefit of doubt going to the batsman. Stoinis sweeps the ball off the fourth delivery towards the backward square-leg boundary, entering the 40s in the process. Seven off the over. Pandya returns to the attack in the 38th over of the innings, and concedes just two runs off the over. 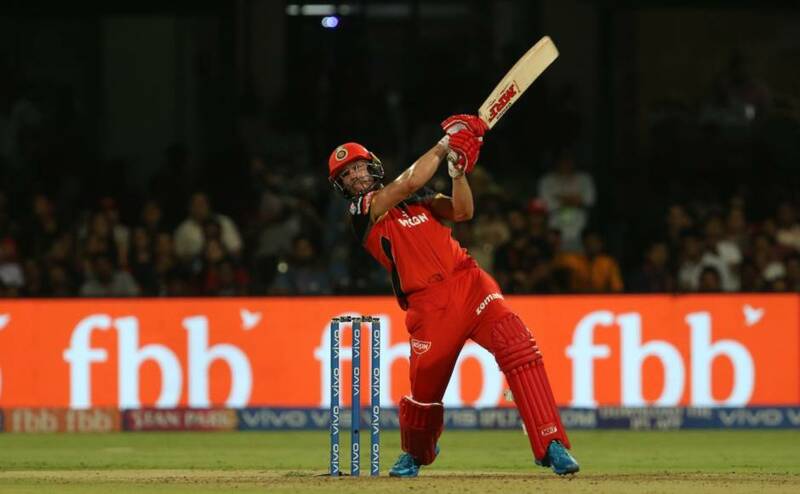 Stoinis, meanwhile, finds himself on 37 at the moment, and reaching his half-century will be something of a consolation. Hardik Pandya brought back into the attack in the 38th over of the innings. Not the best way for Kuldeep to finish his quota, as he leaks 10 runs off the over, including two boundaries — both of which are scored by Stoinis. Coulter-Nile nearly plays the ball onto his stumps in the penultimate ball of the over. Kuldeep signs off with figures of 3/54. Bumrah returns to the attack in the 36th over. Stoinis goes for a pull in the fourth delivery of the over, with Jadeja narrowly missing out on a stunner with the ball dropping short of him. Five off the over. Jasprit Bumrah brought back into the attack in the 36th over. Spin once again playing a huge role in India strangulating the Aussies. The two wrist spinners Kuldeep and Yuzvendra have already picked up five wickets between them. Their wicket-taking ways have upset the Aussie plans of making a fist of the relatively small Indian total. What a comeback by the bowlers. Kuldeep Yadav becomes the first spinner to take a hat-trick against Australia in ODIs. Kuldeep bowls the 35th over, and starts off by conceding a wide. Coulter-Nile gets a top-edge in the third delivery that runs towards the third-man boundary, with Chahal saving a run with some fine athleticism. Five off the over. Chahal continues from the other end. Stonis and Coulter-Nile exchange singles in the first few deliveries, bringing up the 150 in the process. Four off the over. Kuldeep Yadav turns the match on its head with a brilliant hat-trick. The loss of 3 wickets off successive deliveries has broken the back of the Aussie innings. They looked to have a chance till Kuldeep broke through and then cleaned up two more. India firmly in driving seat. Kuldeep finally weaves the magic that was expected of him. What an over by the chinaman bowler! His hattrick-maiden reduces Australia to 148/8, with Wade, Agar and Cummins proceeding back to the pavilion! India now just two wickets away from going 2-0 up in the series! Back after drinks. Pandya bowls a length delivery outside off, Stoinis punches it through covers for a single. Ball two: back of a length and outside off, Wade steers it to third man to bring Marcus back on strike. Stoinis and Wade again rotate strike off the next two balls. WIDE! Pandya bowls it outside off and Stoinis leaves it alone. Stoinins scores a boundary in the penultimate delivery and Hardik follows it up with a dot. FOUR! The routine bad delivery in Pandya's over. Bowls it short and Stoinis pulls it through midwicket. Kuldeep returns to the attack, with the Australians finding themselves in a spot of bother at the moment. The umpire calls for drinks after this over, with the players needing a bit of a breather right now. Hardik Pandya is having a dream series and he has got the big fish. Ravindra Jadeja can't think of dropping a catch like this even in his dreams. India should seal the deal now. Kuldeep Yadav returns to the attack, bowling in place of Chahal. Superb wicket, getting Steve Smith. Good bouncer from Pandya. Caught very well by sub fielder Jadeja. Smith was controlling the innings. His wicket is a big blow for Australia. They are still way short of the target and India need to drive the advantage home. Pandya bowls the 30th over of the innings. Smith collects his eighth boundary in the third delivery of the over. Pandya, after the rough patch that he has been through so far, finally redeems himself as he holes out to substitute fielder Jadeja at deep midwicket. Five runs and a wicket off that over. Preview: Their tails up after overcoming initial jolts to pull off an emphatic victory in the series opener against Australia, India would look to retain the momentum in the second One-Day International on Thursday despite the leaden eyed skies threatening to play spoilsport at the Eden Gardens. 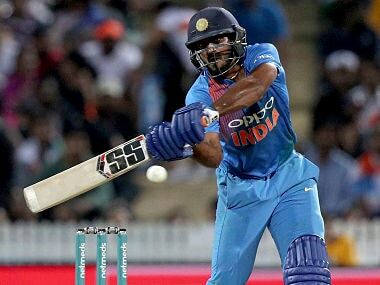 India were down in the dumps at 87/5 in Chennai, before young all-rounder Hardik Pandya (83) and seasoned campaigner MS Dhoni (79) upturned the script with an 118-run six wicket stand that helped the hosts post a challenging total, which the Kangaroos could not match up to in a rain-truncated chase. The tourists, according to their former skipper Michael Clarke, have to win the second rubber in order to have any chance of taking the series. In order to do that, Smith's wards will need to improve on their death bowling which looked rather flat in Chennai conceding 83 runs in the last 10 overs. But at this moment, all eyes are focussed heavenwards, with the Met office predicting thundershowers on the morrow. Another shortened cricketing contest is also within the realms of possibility, as the city has been lashed by spells of heavy showers over the past few days. "We need at least two hours of sunshine to get the ground ready. We are well-equipped, we are keeping our fingers crossed," East Zone curator Ashish Bhowmick had said two days before the game. If the track, mostly kept under covers because of the inclement weather, does not get sufficient light before the game, the wicket would be damp and could assist fast bowlers initially. This could augur well for the visitors who have in their ranks Nathan Coulter-Nile, who bowled really well the other day, returning best innings figures of 3/44 which included the prize wicket of Virat Kohli who departed without troubling the scorers. 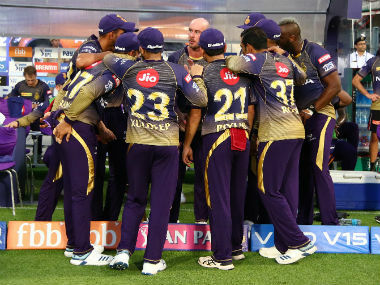 Eden Gardens is a familiar turf for Coulter-Nile, as he plays for Kolkata Knight Riders in the Indian Premier League and exhibited exemplary form this season for the purple brigade. Also under spotlight will be India's wrist spinners Kuldeep Yadav and Yuzvendra Chahal. Chinaman Kuldeep Yadav (2/33) and leg-spinner Yuzvendra Chahal (3/30) shared five wickets between themselves in Chennai. 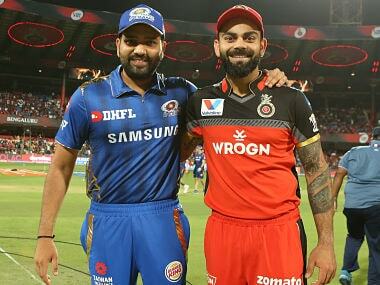 The pair, first of their kind to bowl in tandem in an ODI for India - that's across 43 years and 923 matches — have caused their rivals quite a few problems and would be expected to play an important role here as well. In team news, the Aussies are likely too again miss the services of opener Aaron Finch who injured his calf muscle during training in Chennai. Hilton Cartwright, who made his debut in the first ODI, is expected to keep his place with Travis Head batting at number 4. The hosts might give Ajinkya Rahane another chance to open the batting alongwith Rohit Sharma. Rahane failed in the first game managing just five runs from 15 deliveries. At number 4, KL Rahul could stake a claim after Manish Pandey failed to impress in the last tie scoring a duck. Rohit and Eden have a special relationship and the last time India won at the venue, Rohit shattered the ODI record books in 2014. The Mumbai batsman hammered a world record 264 against Sri Lanka and India went on to win by 153 runs. Australia have a 100 per cent record, and fond memories at Eden. It was at the iconic ground that thery lifted their their maiden World cup, thirty years back in 1987. Back then, Alan Border's side had beaten England by seven runs in the final. The tourists' turned out in their only other ODI game at the Eden in 2003, opposite India. Australia won by 37 runs.